Yesterday Conrad’s class made these. I came by to help. They were all whining that it was hard, but they turned out SO cute. 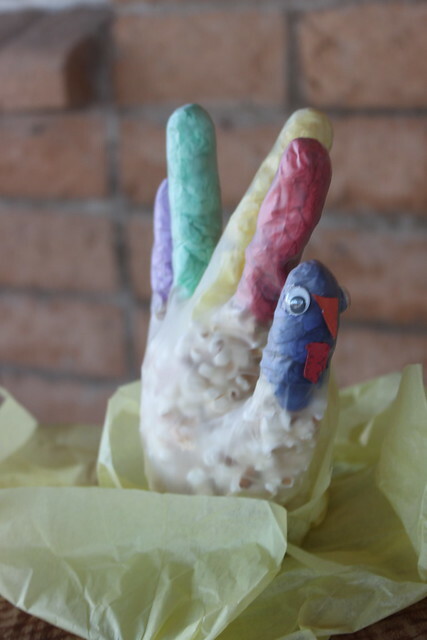 The fingers are stuffed with tissue paper and popcorn in the body. I hope that you all have an amazing turkey day! What are you thankful for? I am thankful for your strength, intelligence, beauty,Rocking Mom Skills, this blog that makes me laugh and your painted fence in the backyard. I really want one just like that! Kristen, you should totally paint your wall then! You could paint the blocks different colors. If you lived closer, I would help you. Should you ever move to Tucson, then I’m your girl! Thank you so much for your super sweet words! They mean the world to me, they really do.-From one “rocking” mom to another. I am thankful for having a loving, caring, beautiful sister! I love you!!! I am thankful for you too sissy! Love, love, love!